When 17 people were killed at Marjorie Stoneman Douglas High School in Parkland, Fla., in February, the nation's concerns about student safety returned to the forefront. Parents all over the country have renewed and growing worries about what their local school districts and law enforcement are doing to protect the community's children while they receive an education. Sandy was no exception. 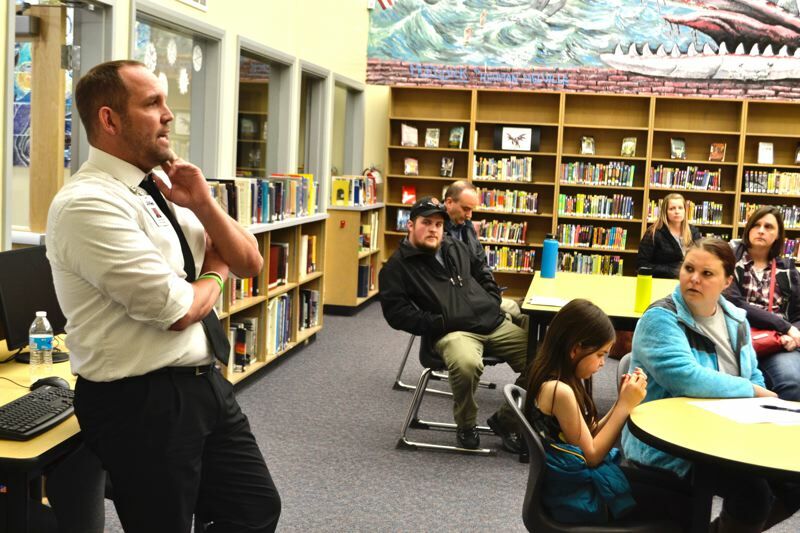 After several parent requests for a public discussion on the matter, Oregon Trail School District Superintendent Aaron Bayer and Sandy Police Chief Ernie Roberts came together last Wednesday evening to host one. In a one-hour safety meeting, Bayer gave a detailed presentation on the work the district has done in the past seven years to ensure student safety, often remarking on how ahead of the curve the district is. In 2011, former police chief Kim Yamashita helped the schools perform a vulnerability assessment. From this information, the school's revamped how they approached safety. "We realized it was really important to change our culture and how we viewed safety," Bayer said. Bayer shared that at Naas Elementary School and Boring Middle School, every door is now electronically locked, perimeter fencing was added and areas that used to have off-the-street access are now guarded by electronically locked gates. All of the schools also now have outward facing cameras and receivers with which staff can engage with visitors before allowing them access to the school. All updates were made according to Federal Bureau of Investigation (FBI) standards. Roberts added that the new Cedar Ridge Middle School is in need of an updated vulnerability assessment, which he will conduct soon. Though the district has time and money into safety measures like the electronic system all schools now have, Bayer explained that safety also is dependent on collaboration between and education of the staff. For six years, the district has taught its staff and students "Run, Hide, Fight" practices to utilize in the case of an active shooter or other dangerous circumstances. "We've found when people just go into lockdown, lock everything down and hide in the corner, that's when people get killed," Bayer said at a previous event. "That's why the federal government says you have three options: run, hide, fight." 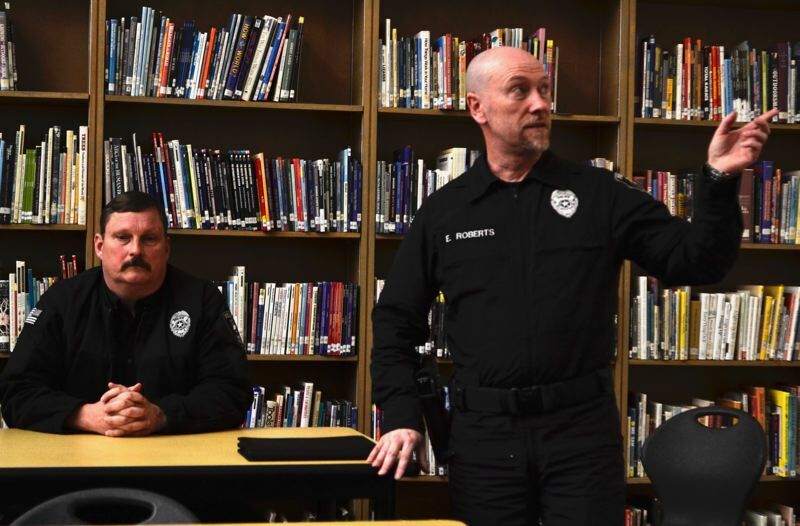 After a detailed presentation on protocol, the teachers all convene in the Sandy High School's mat room and practice taking out an active shooter — or a trained police officer — with a plastic gun. Staff and students are taught Run, Hide, Fight every year, and staff receive refresher courses throughout the year. Besides this training, students also have resources available like the district's "Report It" tip line. Though recent House Bill 4075 implemented a statewide tip line called Safe Oregon in January, Oregon Trail has stuck with its tried-and-true system. "We use Report It because our students are familiar with it," Bayer said. Through Report It, students can text or email concerns they have while at school. District officials receive those messages in real time and can immediately act. Bayer said he fears the state tip line staff members may "circumvent" the school district in the case of an emergency, leaving out the Oregon Trail teachers and staff who might know more about the nuances and history of a situation at hand, and this could cause problems for the schools and possibly families. In many regards, the Oregon Trail School District has become a model for other districts of what safety looks like. Scott Coleman, district technology director, has actually been consulting other schools on best practices. He monitors the electronic systems that control the school's constant "lock out" measures. Students, especially at Sandy High School, also have direct access to a trained police officer while at school. The district has contracted with Sandy police to have a school resource officer for more than 20 years. Current officer Jeff Argubright will serve for three years before another officer takes over. The district's administration and Sandy police have both been asked on several occasions to present to other schools and agencies. "We want everybody to be on the same page" Roberts said. Bayer added, "Our community, OTSD, is just bigger by square miles than their community, but they said we want that to be our community as well." For more information about the school's safety measures as presented, visit oregontrailschools.com.